The battle raging in the hidden war going on outside Otysburg has finally made it’s way into the city… and Amelia is nowhere to be found by her friends. This issue proves that people of different abilities and styles standing together has a fighting chance when faced by evil. In the last issue Amelia’s boss was killed by a secret council, however, Amelia finds that she is being blamed which will lead to having her time eaten up while her friends find themselves seemingly alone. 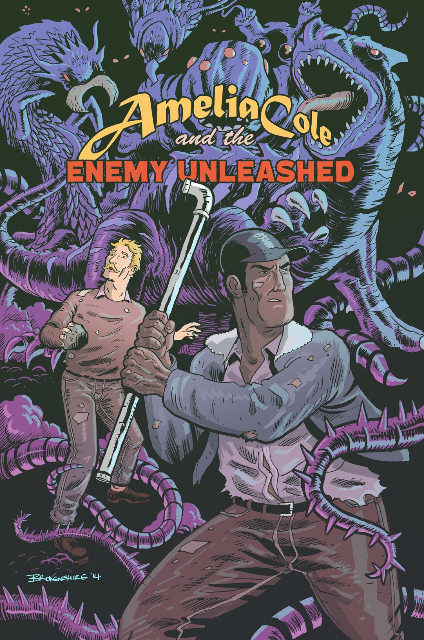 This all ages series continues to be filled with action while focusing mostly on Amelia’s compatriots and former enemies who begin banding together with the Omega Company (a magical military unit) to fight the monsters who consume magic. It creates scenes of the magic and non-magic peoples, along with golem Lemmy, working together to protect their home. On this outside this makes for exciting story, while opening the doors to discussion, especially if you have children, about why it is important for people with different abilities to work together. This continues the emotional world building that has been happening over the last two and half volumes, while more layers are placed on an ever increasingly mysterious plot. There is also another point where the golem, Lemmy, is presented with a choice that has neither a clear right or wrong path. It’s just that a choice has to be made and Brokenshire emphasizes this fact with a clear distinction in panel layout. What is nice here is that it creates another opportunity for discussion if you are reading this book with a family member or with your own child. Often, choices in life aren’t presented as day & night, black & white, right or wrong. Lemmy’s choice is more personal and has positives and negatives, no matter what. It’s a very real and honest moment of character development, for a non-human character, that you do not see often outside of the science-fiction genre. At this point there are two known enemies in the book: The Secret Council, and the monsters looking to consume the magic of Amelia’s part magic/part science world. How or if they are connected is still unclear. For those who have been keeping tabs on the series, Brokenshire continues to play with the backgrounds laying in easter eggs of both a nerdy and pop-culture nature. Also, longtime character Hector (now the former protector and current military man) seems to be taking on more chiseled features. The neon and pastel color combinations create bright splashes that help capture the attention of all age groups, and help lend gravity to when enemies, such as The Secret Council, appear on the page with greys and blacks. Like Doctor Who, Buffy the Vampire Slayer or Parks and Recreation, a need to know about the previous volumes isn’t absolutely necessary to enjoy the action and adventure. However, just like those shows, it gives your a fuller knowledge of the importance of the events and emotional connection to the characters. Long time readers may want to go back through volumes one and two to look for other thematic touches. For example, the secret council always repeats the words of the member who was speaking before and complete each others’ sentences. However, did you notice how many of them speak each time? No? Go back and take a look. Plus, once Amelia’s magic is unleashed there are always special symbols that surround her. Have you noticed any of these symbols around Otysburg? This series has already established a magical world, a non-magical world and Amelia’s current home: the world made of half magic, half science. Could these symbols lead to more dimensions? Mild spoiler alert: if the serious tone and fatality rates of the last few issues have gotten you down, then at least here there is a more positive message to be found. Of course, that is no guarantee for the future as the final splash page shows: things are about to get real… well, as far as magic is concerned. This issue serves as a good transition-action filled piece making you feel like a climax is just around the corner for Amelia, Lemmy, Hector and their band of friends.